PORTLOCK, NATHANIEL, ship’s captain, maritime fur trader, and author; b. c. 1748; d. 12 Sept. 1817 in Greenwich (London), England. Nathaniel Portlock entered the Royal Navy in 1772 as an able seaman in the St Albans, commanded by Charles Douglas*. His rapid promotion to midshipman suggests previous experience in a merchant vessel. On 30 March 1776 he was entered as master’s mate on board the Discovery, in which he participated in the third Pacific voyage of James Cook*; he was transferred to the Resolution, also on the expedition, in August 1779. Returning to England before the expedition as a messenger, he passed his lieutenant’s examination on 7 Sept. 1780, at which date he was officially stated to be “more than 32.” He then served in the Channel fleet on the Firebrand. In May 1785, Richard Cadman Etches and other merchants entered into a partnership, usually known as the King George’s Sound Company, in order to prosecute the maritime fur trade between the northwest coast and China. 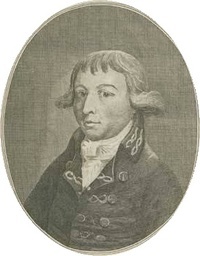 The owners appointed Portlock commander of the King George and of the expedition; George Dixon* was to command her consort the Queen Charlotte. As Portlock wrote, “Both of us having accompanied Captain Cook in his last voyage into the Pacific Ocean, were deemed most proper for an adventure which required no common knowledge and experience.” Having sailed westwards around Cape Horn, the expedition made its first North American landfall in Cook Inlet (Alaska) on 19 July 1786, and came upon Russian traders there. Portlock soon noted a disparity in British and Russian methods of collecting furs: whereas he expected to barter for pelts and food with the local Indians, the Russians had brought native hunters with them and treated the locals harshly. The contrast was evident to the Indians as well, and at one point a native middle man requested armed assistance for his people against the Russians, but he was denied this aid. Portlock had arrived late in the trading season, and his fur harvest was consequently poor. The two ships coasted southwards, but bad weather prevented their attempt, from 23 to 28 September, to enter Nootka Sound (B.C. ), where the two captains had agreed to winter, and so the expedition refitted at the Sandwich (Hawaiian) Islands. The following spring the ships returned to the northwest coast, arriving at Montague Island (Alaska) on 24 April 1787. 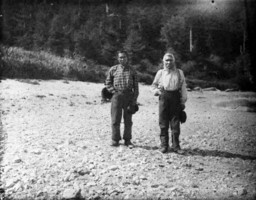 Some two weeks later Dixon was led by Indians to the Nootka, commanded by John Meares, who with his crew had passed a desperate winter in Prince William Sound (Alaska). Portlock provided assistance to make the ship seaworthy, and it was able to sail on 18 June. Meanwhile, having learned that Meares expected one of his company’s ships to arrive at Nootka Sound from China that month, Dixon in the Queen Charlotte had proceeded southwards to forestall it. That winter Portlock and Dixon sailed separately to Macao (near Canton, People’s Republic of China), where their combined cargo of 2,552 skins realized 54,857 dollars. Proceeding then to England, they reached Margate roads in August 1788, bringing home a consignment of tea for the East India Company. Portlock’s account of the expedition, published in 1789, presents lists of the flora and fauna he observed, often with descriptions and illustrations, as well as ethnographic notes and a geographical record of the entire voyage. Returning to service in the navy, Portlock was appointed to command the brig Assistant, in which he accompanied Captain William Bligh in 1791 on his second attempt to transport bread-fruit plants from Tahiti to the West Indies. The voyage was successful, and the Jamaican House of Assembly awarded 1,000 guineas to Bligh and 500 to Portlock. The ships returned to England in August 1793 and on 4 November Portlock was promoted commander. In 1799 he commanded the sloop Arrow, which on 9 September captured the Dutch vessel Draak. On 28 September he was advanced to captain, but does not appear to have had further employment at sea, perhaps owing to ill health. He died on 12 Sept. 1817 in Greenwich Hospital. Nathaniel Portlock had done well for himself; rising from inconspicuous beginnings, he had benefited from the experience and training of Cook’s third Pacific voyage. His subsequent commands in that ocean were important in demonstrating the growth of British commercial and imperial interests there. His second son, Joseph Ellison, became a major-general in the Royal Engineers and had a distinguished career in geology and natural history. 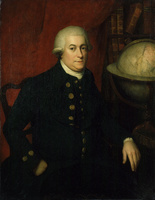 Nathaniel Portlock was the author of A voyage round the world, but more particularly to the north-west coast of America . . . (London, 1789; repr. Amsterdam and New York, 1968). 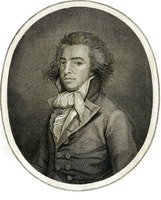 A portrait of him engraved by Mazel after Robert Dodd forms the frontispiece. DNB. B. M. Gough, Distant dominion: Britain and the northwest coast of North America, 1579–1809 (Vancouver, 1980). J. T. Walbran, British Columbia coast names, 1592–1906 . . . (Ottawa, 1909; repr. Vancouver, 1979), 399–400. Barry M. Gough, “PORTLOCK, NATHANIEL,” in Dictionary of Canadian Biography, vol. 5, University of Toronto/Université Laval, 2003–, accessed April 26, 2019, http://www.biographi.ca/en/bio/portlock_nathaniel_5E.html.